1ST CLASS DELIVERY! UK SELLER! BEST QUALITY! Having a huge clear out and finally getting rid of these Chloe red cateye sunglasses. Condition is Used, with minor wear and tear. Worn a handful of times in their lifespan. Only obvious area of corrosion is the discolouring around the hinges from being out in the air. Comes with box which is worn, no dust cloth. Serial number has been scratched off (I had two pairs that someone tried to steal from me). Dispatched with Royal Mail 1st Class. Celine Petra Cat Eye Tortoise Shell frame Sunglasses. Chucky cat eye shape Celine sunglasses. Distinctive Celine branding on the side of the frames and the three dot logo on the front of the frames. Condition is Used. Comes with original case and glasses cloth. Little large in size. Dispatched with Royal Mail signed for 2nd class. Joules Salcombe Navy Blue Polka Dot Print Ladies Sunglasses. Blue soft pouch with floral lining. 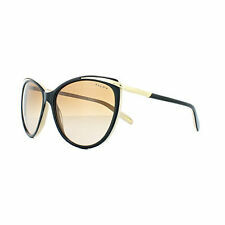 Jimmy Choo White/Silver/gold/sparkles Women's Cat Eye Sunglasses Frames. Dispatched with Royal Mail 1st Class. Model - M3645S. M3645S 001 -56 -17 -130. Lens Colour - Grey Gradient. 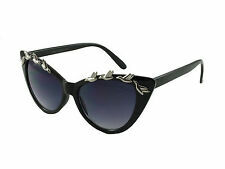 STRADIVARIUS Black Cat-eye Acetate Sunglasses. Genuine Marc Jacobs sunglasses. Bought them last year and only used them 5 times! For more information dm! marc jacobs sunglasses. Condition is Used. Dispatched with Royal Mail 1st Class. Asos cat eye sunglasses VINTAGE STYLE . Condition is Used. Dispatched with Royal Mail 2nd Class. Treat yourself to the classic Miu Miu Cat Eye Sunglasses. Looks great all year round. Colour - BLACK NOIR with gold arms. I would add a thin gold chain to these so you can hang them as a necklace when not wearing. Ladies Michael Kors Sunglasses. Condition is New with tags. Dispatched with Royal Mail 2nd Class. 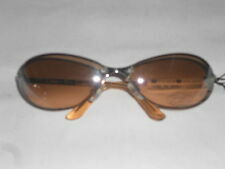 MIU MIU Womens Designer Sunglasses Brown SMU09G with cleaning cloth and case. Spitfire Sunglasses Cats Eyes Weekend Style 100% UV protection Black No Case. Dispatched with Royal Mail 2nd class. MODERN PLASTIC SUNGLASSES IN A CAT EYE SHAPE. SUNGLASSES IN GOOD CONDITION. SUNGLASSES ARE MADE IN ITALY. Ray-Ban Sunglasses 4181 601/9A Black Polarized Green are a simple and understated design which is elegant and stylish as well as being comfortable and giving excellent sun protection. Marc Jacobs Womens Sunglasses. Condition is New without tags. Dispatched with Royal Mail 1st Class. Bvlgari Sunglasses 8178 901/8G Black Grey Gradient feature hand enamelled scales on the edges of these gorgeous cat eye sunglasses in homage to the Bvlgari Serpenti theme. Thin curved arms in the curve of the snake continue the theme with panache and style. Used but like new. Suitable fro small face. Come with original case. TOM FORD Emma Sunglasses Model: FT 0461 02D - Made in Italy. Model: FT 0461 02D. Lens: Polarized Grey Gradient. The History behind Tom Ford: Tom Ford, arguably the most powerful man in fashion, originated from Gucci. Dolce & Gabbana Sunglasses DG4304 501/8G Black Grey Gradient feature a polished metal bridge that then continues above the rims to accentuate the cat's eye and to give a lovely contrasting finish to these cool acetate frames. Bvlgari Sunglasses 8162B 53838G Black Grey Gradient feature some amazing intricate crystal detailing on the temples and on the cat's eye raised corners for a truly glamorous chic look that is simply stunning. The cat's eye shape adds some of that vintage style that is so popular and works so well on these gorgeous Bvlgari sunglasses. POMELLATO PM 0002S Cat Eye Mirrored sunglasses Brand NEW.